Norman Baker is a small tornado of a man. You could call him the Elmer Gantry of kombucha, a proselytizer who extols the false virtues of the fizzy, fermented tea. In early 1994, Baker and his cheery, cherub-faced business partner, the late Betsy Pryor, began Laurel Farms, a mail-order network based out of Venice, California. Baker and Pryor would mail kombucha mothers affixed with stickers that peddled a gauzy promise: EXPECT A MIRACLE. Baker once estimated that kombucha, made from discs that resembled extraterrestrial pancakes, possessed the intelligence of a dolphin and the curative properties of an elixir. Baker is an italicized character of a person, a man who sings to his SCOBYs like one would a small child. He warbles through lullabies in English, French, Hebrew, Italian, Japanese, and Spanish, he tells me, to every bowl of kombucha he gets; he’s never missed a bowl. He recites chants to the kombucha in the form of slurred vowel salads: e-a-e-a-o-u. Baker, 68, is fervent and digressive in conversation. He is unabashed about his stated accomplishments, masking his braggadocio beneath a costume of eccentricity. He makes loftily altruistic claims about curing politicians all over the world from near-fatal spells of illness. Take King Fahd of Saudi Arabia, for example. He relays his imagine-that anecdotes as if battle-ready, punctuating each one with a certain turn of phrase: I mean, true story! Baker alleges that, in spite of Laurel Farms being long gone, people from all over the world still call him for kombucha starters. And he swears that in the 25 or 30 years he’s been giving out kombucha—he’s not too sure how long it’s been, because he’s lost track of time, he tells me—he’s never taken a cent from anyone. When they began Laurel Farms in 1994, Baker and Pryor charitably charged customers maladied with H.I.V., AIDS, cancer, or multiple sclerosis $15 for starter cultures. They made the rest of the world—that is, “healthy” customers—pay a fee of $50. Baker and Pryor started shipping kombucha mothers (or starters, or "mushrooms," as Baker calls them) across the country during the thick of America’s initial kombucha boom, which lasted from 1992 to 1995. Because of its supposed healing properties, kombucha consumption thrived amongst vulnerable populations, demographics who had otherwise felt abandoned by modern medicine. The drink gained particular favor among members of the queer community of Los Angeles with H.I.V. and AIDS, whose only medical option for treatment was azidothymidine (AZT), an antiretroviral medication. During a time when H.I.V. and AIDS patients were pathologized as victims of an incurable gay cancer, kombucha was a folk remedy that presented an ideal sanctuary from the snare of Western medicine. Baker and Pryor offered hope, a scarce and valuable commodity, in a time of uncertainty. What came along with this, though, was an inadvertent obfuscation of what kombucha could actually do for the human body. In this period, kombucha was thought to restore color to ashen gray hair, make psoriasis fade, and, of course, reverse H.I.V. and AIDS. Though Pryor was reluctant to declare that kombucha could eliminate such maladies, Baker bought into these fictions wholesale. And so did many of Laurel Farms' customers. Baker and Pryor’s mail-order, grassroots network operated on a much smaller scale than today’s financially vibrant commercial kombucha industry. Today’s America is one in which bottled varieties of kombucha line the aisles of grocery stores. To Baker’s mind, though, the drink’s modern-day popularity can be traced directly back to Laurel Farms. Baker and Pryor first encountered kombucha during a 1992 meeting of the Brahma Kumaris, a new religious group out of India, in Hollywood. A woman who Baker describes as a “sheik-lady” brought out a small bag with a kombucha mother that looked like a gelatinous lilypad. She had essentially bequeathed it to the pair, telling them that they would get kombucha to the entire world. At first, neither Baker nor Pryor bought into it; this kombucha sounded as phony as snake oil. But the woman insisted it was real. Pryor, in Baker’s retelling of it, became fanatical about studying the practical effects of kombucha. She was a woman of many faces—advertising copywriter, failed medical thriller novelist, amateur Egyptologist—who’d also spent a few years the decade prior researching the AIDS epidemic in Liberia. So she started to collect information about kombucha, learning that it had likely originated in 220 BCE in China and roamed through the Far East, attaching itself to mythic tales of buffering against black plagues. She sunk her teeth into Kombucha: Healthy Beverage and Natural Remedy From the Far East, a 1991 reference book by German author Günther W. Frank, the man Baker describes as the “guardian” of kombucha on the planet before him. Baker and Pryor figured they had a budding empire on their hands, so they began Laurel Farms in 1994, filing the trademark for the phrase “Kombucha Tea” in July of that year. Laurel Farms functioned as a kind of kombucha nursery, a distribution node from which Baker and Pryor mailed out blobs of starter kits with recipe pictorials and motivational slogans. Pryor had also been working on a book, Kombucha Phenomenon: The Health Drink Sweeping America, eventually published in July 1995, a paperback of testimonials for the drink and its healing potential. Word about Laurel Farms got out quickly after its inception, staining the pages of Vogue and Newsweek. 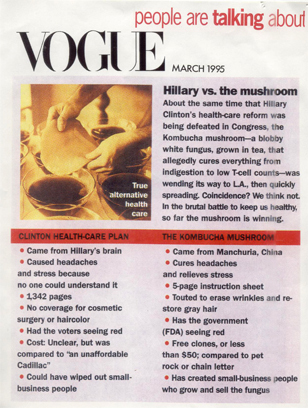 From today’s vantage point, early reports of kombucha read as if they were written by and for aliens, with fanciful language about this “Manchurian mushroom.” Most of the coverage struck an utterly bemused tone when it came to Baker, a hyperkinetic lifestyle guru who belonged to the same genre of human as Richard Simmons. Soon enough, journalists observing this trend began injecting a dash of skepticism into the conversation surrounding the small-scale craze. Both the Los Angeles Times and New York Times ran articles on the fad within weeks of one another in December 1994. The pieces were equally ambivalent about the drink’s supposed benefits, with medical experts quoted agreeing that they were uncertain about how potent kombucha really was. “There is a tendency to view such phenomena as either miracles or quackery when in fact they are never more than part of a complicated protocol,” one committee head of AIDS advocacy group ACT UP, quoted in the New York Times, said of kombucha. In December of 1995, just as the hype surrounding kombucha had been reaching its apex—at its peak, Laurel Farms was shipping out 400 mothers per month across the country—the Centers for Disease Control and Prevention released a report about two women in a rural town in northwestern Iowa who’d been drinking kombucha daily for two months. The details were upsettingly grim: In April of that year, one 59-year-old woman had died, and another 48-year-old woman had fallen terribly ill after drinking kombucha derived from the same mother. In spite of this tenuous link, the Iowa Department of Public Health recommended that "persons refrain from drinking Kombucha tea until the role of the tea in the two cases of illness had been evaluated fully." The CDC wasn’t able to establish causality between kombucha consumption and illness. Not a single other one of the 155 other people in the state who drank kombucha from that SCOBY had reported any symptoms. A subsequent microbial analysis found no trace of human pathogens or toxin-producing organisms. People were coming to us saying, you don’t recognize us. There was evidence that our T cells went from zero to 250 in four weeks. You saved our lives. Baker tells me the loss of public faith in kombucha, and resultant shuttering of Laurel Farms in Venice, effectively bankrupted Pryor, who later moved to Sarasota, Florida. (Baker is circumspect about what happened to Pryor after this visit from the FDA, though there is some indication that Pryor ran a form of Laurel Farms in Sarasota well into the aughts.) Early hype surrounding kombucha’s miraculous capabilities had died down after that CDC report, and what remained in its wake were people who were still sick and looking for a cure. And then the magic of kombucha wore off, as the magic always does, and we moved on. “The names ring a bell, but I couldn’t tell you who they are,” Sandor Katz tells me when I mention the names of Baker and Pryor. If anyone can be credited with correcting the wild spread of misinformation surrounding kombucha and its properties, it is Katz, a queer farmer and fermentation specialist living with AIDS. He currently resides in Liberty, Tennessee. “Fermented foods have been an important part of my healing," he wrote on the back cover of Wild Fermentation. Katz began taking antiretroviral and protease inhibitor drugs in 1999, and he has continually sought the help of live-culture foods like kombucha to aid the digestive problems introduced to his body by these drugs. But these foods have by no means presented a cure; they’re part of a holistic regimen. This nuance, Katz fears, has been lost on those who read him. One of his more exhausting tasks as of late has been to sharpen his words as carefully as possible to ensure that they won’t be grossly distorted by readers. Seeing his own words perverted, to the detriment of those living with H.I.V. and AIDS, has forced Katz to become careful with the way he speaks about drinking kombucha while living with his illness. Katz was several degrees removed from Laurel Farms. He first learned about kombucha in 1993, endeared to it by a friend who’d begun drinking it earlier that year to deal with her Kaposi's sarcoma (KS) lesions. This friend didn’t necessarily think that kombucha would rid her of these lesions, but she was giving it a try. That friend was named SPREE. SPREE, now 60, lives in Sassafras, a community close to Katz's residence in Liberty. Diagnosed H.I.V.-positive in November of 1989, SPREE attended an H.I.V. Health Fair, mounted by a nonprofit called Nashville CARES, in 1993. There, SPREE met a woman whose name she doesn't remember, possibly Sharon, who spoke endlessly about kombucha, displaying mothers in little baggies before handing them to SPREE. “She basically said that it was like a magic elixir and has had a lot of good reports from people with H.I.V. and AIDS,” SPREE tells me. The woman told her audience tall tales of people putting their kombucha mothers into baby pools and seeing them swell to that size. She had seen this happen with her own eyes when she threw one of her starters out in a ditch in the backyard. Following a torrential downpour, the mother grew to be as big as the ditch that contained it. The cumulative effect of eating lots of live bacterial foods is stimulating to the immune system, but I don’t think it prevents or cures certain diseases. Certainly not H.I.V. SPREE didn’t anticipate how involved the process of caring for her kombucha would be. It entailed getting a gallon jar and sterilizing the jar rigorously, brewing black tea, putting the mother inside it, and waiting 10 days for the mother to spawn another mother within what she calls the “kombucha liquid.” Afterward, SPREE had to get two more gallon jars and repeat the process all over again. At first, SPREE really believed the kombucha was helping her, particularly because that woman from the H.I.V. Health Fair had sung its virtues so convincingly. Besides, it tasted delicious. It was a drink as jittery and skittish as soda, with the mouthfeel of tart cider. SPREE decided she had to let her mothers go. So she and her friends, Sandor Katz included, held a party to bid them farewell. They went to the front yard of the commune with a Vitamix and put the mothers inside, violently pulsing them into a solution. At the last minute, Katz came over and took a handful of violet leaves, the shade of spruce green, and threw them in the Vitamix. The friends took off all their clothes and rubbed the resultant paste all over their bodies, experiencing a body high that SPREE likens to entering a different dimension. They ran around the yard dancing and singing, with resplendent green gook clinging to their skin. SPREE didn’t stop drinking kombucha after that day. She simply began to realize that kombucha wouldn't rid her of her lesions. SPREE still drinks kombucha regularly, guzzling it at parties, with an awareness that it won’t buffer against her disease, but only make its symptoms a bit more bearable. And when she drinks it, she feels as if a wave is surging through her body. Norman Baker spends his days reading people’s colors over the phone. He volunteers his knowledge to strangers, free of charge, offering to read them like an MRI machine would. Me? I’m purple, indigo, blue, and green, mostly, with a little bit of yellow missing. No orange or red. Just when I think it’s over, he begins to sing to me, a vowel-rich mantra that lasts 30 seconds. At the end, he asks me if my fingers tingle at all, and I’m afraid to tell him they don’t. Baker still lays claim to kombucha’s initial popularity in the States, but commercializing it on such a scale has led to, in Baker’s mind, an unfortunate compromise of kombucha’s integrity, an erosion of its “life force.” He worries kombucha has now fallen into the wrong hands, and is now beholden to the whims of the market and perceived corporate malice. There is barely a whisper of Baker in histories of how America fell for kombucha, and he has all but disappeared from the public eye. Most recently, he was mentioned as an aside in an episode of food science podcast Gastropod from last August, when co-hosts Cynthia Graber and Nicola Twilley effectively laughed Baker off when tracing how kombucha became the backbone of a multi-million dollar industry in the States. “Norman Baker, bless his heart, said that kombucha has an intelligence well above the level of a dolphin,” Twilley said after playing a sample of his AP interview. “I don’t even know how to respond to that,” Cynthia Graber replied. Thirty days later, he claims, the number of calls coming in was outrageous, with people telling him that their kombucha now tasted like Lipton-brand Peach Iced Tea. His command to his blobs worked wonders. Baker insists he didn’t have any choice but to become invisible. Though he purports to own “about 20 different companies,” he doesn’t give his email address out because he says he’d lose his freedom in ten seconds. Hell, he doesn’t even carry a cellphone. He figures he’ll be flooded with calls. Everyone around the world wants to talk to him, he explains. You’re going to hear a lot about me coming up. I would not be surprised if, all of a sudden, I become one of the richest people on the planet. It’s a curious statement of ambition to hear from a man who claims to be motivated by selflessness rather than profit, but he course-corrects soon after: “Again, it’s not about the money. It’s about the guardianship. I just want to bring the truth back to the people.” It’s the people around him who don’t get it, he says, but he figures they’ll come around eventually. He’s seen miracles, and he’s expecting a few more. Stephen F. James is an artist in Brooklyn. Hi All! As much as I enjoyed reading this article. I want to SET THE RECORD STRAIGHT!!! Norman Baker definitely did NOT give me my first kombucha culture. It came from a friend of my family who just traveled back from the Himalayas. I rad about him and Betsy prior about 2 years later after my family had been making kombucha on their own. Also the spiritual healer in India was also NOT Norman. It was the last Sathya Sai Baba. I see F52's selling Sandorkrauty's book. I have it, or I'd get it from 52 signed by him. He's a cool dude, and the book's good value for the money. Ok, I guess I sound like a commercial now. I wince when I see the Kombucha selling from my local HF store for over three bucks a bottle. Pour some shu-gah on me! There's a sucker born every minute. I had a friend who kept one of those slimy, revolting things alive for years and years. Good story, Mayukh. I'm sorry but that was the most long winded article I think I have ever read? I truly can say I did not enjoy that at all? Really good article. Well written. I, too, brew my own Kombucha tea but sadly not with such passion as these individuals. I did watch the short video on Baker in his speaking to crowds. I researched his name and link to Beethoven and the academy award that he references in the beginning. No such thing unfortunately. There is however a Norman G. Baker who was a great inventor of things and ambitious human being. He passed in 1958. Strange he would claim these achievements to others yet no search on the internet references this Baker in the article. Excellent article! Enjoyable and informative read. Great article and sophisticated read for the days we find ourselves in now. Your reference about Katz and his need to sharpen his words and the reasons why are paramount and timely. Illness and fighting it is about your immune system, as he stated. I am a faithful Kombucha drinker and brewer for a few years now because I know the connection and science behind the immune function. Although I do not sing to my 'mushrooms' nor do I talk to my plants, my Kombucha provides quite a bit of immune support, for which I am grateful. I am astonished and saddened by how many people believe this hooey, and how many charlatans take advantage of people. I won't be able to unsee the image of a kombucha mother filling an entire ditch. really enjoyed this piece, mayukh. thanks! What a terrific piece—thank you, Mayukh! It's so upsetting to reflect on the scale of distress and desperation through the HIV epidemic, you can't blame anyone for looking to kombucha with hope.